On July 8, I’ll take off for Thrillerfest, the annual gathering of thriller writers and fans held at the Grand Hyatt in NYC. It’s always a blast to catch up with writer friends and fans (many come back from year to year). There are many events over the three-day conference and to keep it running smoothly takes the help of lots of generous volunteers. 126 in fact. I know this because I’m scheduling them! It’s fun to try to match up folks to the things they’re interested in–readers with writers, writers who are fans of other writers. It’s all good, but frantic! So I needed a little break tonight. We have kids, so we have an Xbox. And Xbox Karaoke Revolution arrived in the mail this week. Now, I’ve never Karaoke’d in my life. Not in a bar. Not anywhere. And I hear that the Xbox version is not real Karaoke. But it works for me! I went last, of course. I made a character named Lindsay who wore a sweet pink twinset and some wicked cropped jeans and pink heels. And I perused the songs…too many choices, but lots of familiar tunes. What did I pick? It was no contest. I would rather stand there and sing all night long, verses having to give a public presentation speach. Karaoke is something we all have got to get used to, the first few times in a bar will scare the hell out of you, then you realize, hey I can do this and am not half bad.The secret is knowing where your voice can and can’t go. You will then pick your songs from your vocal knowledge. Watch the booze, it will mess with the vocal cords,and of course your rhythm. You stop spreading your vile untruths about beer!!! It ALWAYS makes karaoke better! Oh, when are we hanging out??? I’ve only done karaoke once, a very sad moment in which I cracked and sang Ruby Tuesday. 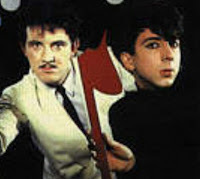 I like the Soft Cell choice way better — although never would I have gotten a 100! As for beer, it would have been necessary for my listeners and for me given the pain of hearing my own voice. I’m going to remember the tip about the pink heels. Have fun at Thriller Fest!